WHAT DOES A MOTH FLY LOOK LIKE? WHAT ABOUT MOTH FLY LARVAE IN OTHER AREAS OF THE HOME? Moth flies are small gray/black flies which thrive in drain pipes and sewer lines. Though they look a lot like a small moth, they’re actually in the fly family. Moth flies need a lot of moisture to complete their life cycle which means they will hatch and thrive in bathrooms, shower stalls and other damp rooms with a good supply of moisture. Moth flies are fairly small “moth like” flies. Unlike moths and flies, moth flies cannot fly well. They tend to “drift and hover” around nest sites and if they get relocated out in the open, are vulnerable. Moth flies have wings shaped like a leaf of a plant and one can see “hair like” fibers on all parts of their body. This characteristic has given led them to receive nick names like drain moths, drain flies, drain gnats, moth fly, sink moths, sink flies and incinerator gnats. 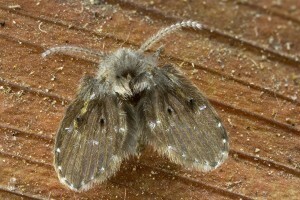 Moth fly pupae will remain dormant during cold months. Commonly found in septic tanks and sewer systems, they’ll hatch in the spring and live their lives in these dark and shady underworld. But since they fly, its not uncommon for some to forage up through the drain line and find their way into living areas like bathrooms, saunas, jacuzzi’s, shower stalls and bath tubs. Once in the home, adults will seek a mate and females will lay eggs. Naturally drawn to moist areas like that commonly found in tile grout, their eggs will thrive all year long if given the chance. A sure sign of moth fly nesting is when you see small “worm like” larva crawling out of shower or bath tub drains. They might also be seen on the walls and floor of tiled wet rooms. These larvae are many times mistaken for some kind of leach. In fact, the larva of moth flies thrive in any kind of mold ridden crack or drain line slime which commonly builds up during normal use in most any home. Drain line slime is the favorite place to lay eggs; the slime enables the eggs which need to be protected and sheltered. The eggs and hatching larva embed themselves in this slime so they don’t wash away and will feed upon the natural organic matter contained within. This life cycle will take about a month to complete and once established, adults will be seen fluttering above active nest sites in the home. The first thing to understand is that products like bleach or “drain-o” won’t resolve the problem. True, they can reduce some of the slime. But it only takes a small amount to protect the eggs so this alone will not solve the problem. Furthermore showers and tubs which have ceramic tiles will harbor tiny amounts of the organic matter moth flies need to reproduce. This means even when something appears to be “clean”, it can still easily support developing young. 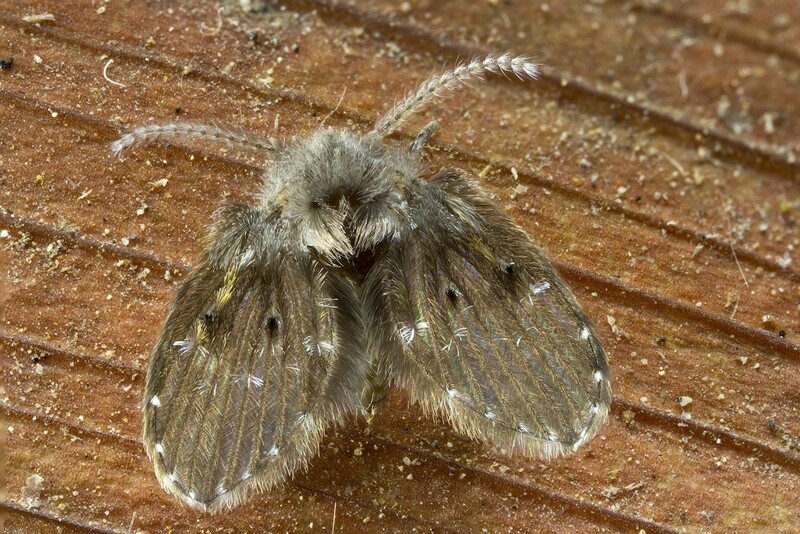 Sump pumps, french drains and wet crawl spaces are also great locations for moth flies. For this reason moth flies can be much harder to control compared to other small flies because they need such a small area in which to live and reproduce. So what’s the best way to proceed? Like most flies, there are several “space spray” products one can use to kill the adult stage. And this is most important. By killing the adults, you’ll effectively break their life cycle because without adults, there will be no way for eggs to be laid. But this also means you must be persistent because space sprays don’t last long. You can actually use them more than once a day. They’re very safe, cover a large area quickly and they don’t pose a hazard to people or pets because they don’t linger. Basically they’re active for an hour or two and then they dissipate. 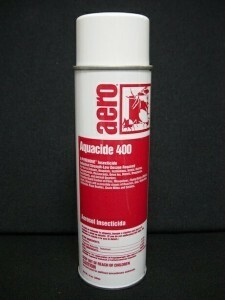 A good option for this type of treating is AQUACIDE. This water based aerosol will quickly control adults, can be used as needed in all parts of the home and is easy to apply. Basically a 3-5 second blast in the average sized bathroom once in the morning, once around lunch time and then again sometime in the evening should keep hatched adults controlled. Larger rooms like kitchens would require more time per treatment but in general, it should not take more than 10 seconds to treat any room. A more “permanent” and convenient way to space spray is to install AEROSOL MACHINES in any room with moth fly activity. These machines are about 1/2 the size of a box of cigars and run on batteries. Basically they will do the work for you by releasing a small blast of pyrethrin every 15 minutes. So all you have to do is set it and forget it. Refills will usually last a month and can be replaced as needed. These are very handy for ongoing problem areas that need constant attention and can be deployed anywhere in a structure where needed. Set one machine up in every room measuring up to 400 sq/ft. So if you have two rooms just 200 sq/ft each but separated by a doorway, you’ll need two machines. In each machine you’ll need to place a can of CLEAR ZONE. These refills will last 30-40 days and can be used safely inside the home – even in kitchens and bedrooms. Ultimately, taking away the reproduction site of the moth fly is the best solution. By removing where they can lay eggs you can in theory eliminate them altogether. And the best product for this is SURVIVORS. Simply pour it down the drain pipes and Survivors will remove the nest sights these flies need for egg laying. Apply about 3-4 oz per drain per once a week. Do the application late at night, before you retire, when you know the drain will sit for several hours with no one running water. This way the active in the Survivors can have it’s best impact by cutting through the slime and organic matter which naturally builds up. On the evening following the application of Survivors, spray for 3-5 seconds down the drain with PT-CYKICK AEROSOL. 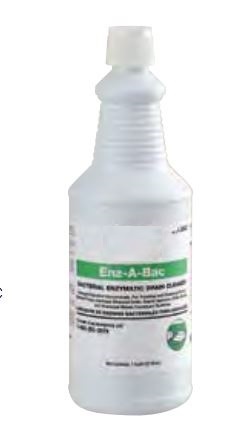 This fast killing, slime penetrating treatment will kill off developing larvae and should be used at least twice a week to interrupt the developing stages. Applying Cykick twice a week for 2-4 weeks along with using Survivors once a week will get control of the problem within a month. But to insure they don’t return, treat at least once a month during the warm season when moth flies are most active. For the “worm like” larvae commonly seen crawling around shower stalls, tiles and grout work, apply the Cykick aerosol to the cracks and crevices on the same schedule as when you treat down the drain. Lastly, the FLY WEB FLY TRAP can be deployed in any room where adults are seen. It’s small but works well at catching small flies, moths, mosquitoes, gnats and more and will no doubt help break the cycle and end the infestation. Set them out where you find active flying pests in the home and they will help solve the problem by removing some of the adults.